I’d heard good things about the Round Rotherham from the post-race chat on other ultras so decided to give it a try. So if the Mountain Trial was Romanticism, I thought, now for some dirty realism … This was only partially true however! The race was first run in 1983 and some folks certainly looked they’d done every one since. 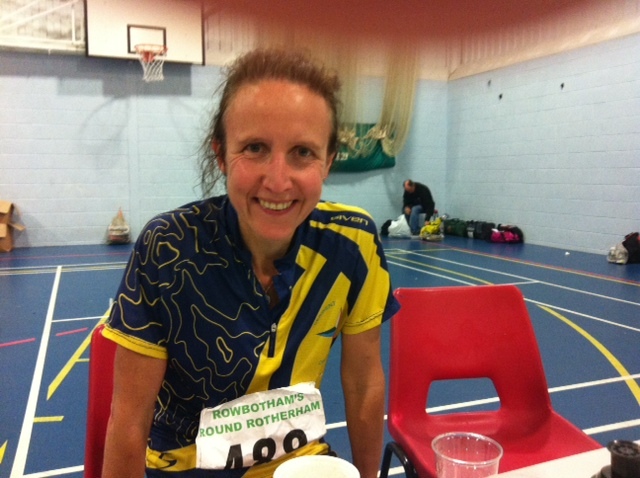 It’s full title is Rowbotham’s Round Rotherham, named after Rotherham Harriers’ secretary and president Ralph Rowbotham who devised the route and nurtured the event. There are about 150 walkers who start at 6am and the same number of runners, starting at 7, and I’d been told that navigation was easy as there are plenty of people to follow. This was definitely the case and, when it wasn’t, white-on-black waymarkers are in place at over half of the decision points. Anyway, to start at the beginning, I’d decided not to rekkie the route, but had printed out colour maps and ‘Wainwright strips’ from the excellent Henry Marston website. I also had route instructions for direst emergency but these didn’t come out of my pack! I eyeballed the splits between the 7 checkpoints and came up with a 11 hr 15 min schedule. Drove up to Rotherham on the Friday night, tricky finding the event centre at Dearne Valley College but made it after a couple of U-turns! Bagged some floor space and asked them to turn the heating down … cramp during a race may be regarded as misfortune, cramp before a race looks like carelessness (with apologies to Oscar Wilde! ).Lights came on at 5:30am to wake the walkers so I read for a bit, then had my breakfast of pre-toasted potato farls & black coffee (dairy and yeast-free regime). It was nice not to be stressed and have time to chat to people. You could leave a drop bag to be taken to Checkpoint 4 at 30 miles, so I put my pasty and a can of Red Bull in there and gave my phone an extra charge to ensure my ViewRanger trace didn’t die. I checked my schedule and was delighted to find I’d made a lucky maths error and it added up to 10 hrs 15! The organisers are very relaxed about kit and the only compulsory item is a mobile phone. With the frequency of checkpoints, you could very easily do this race with a bum bag. I rarely needed water between checkpoints. This would be a good ultra for beginners as not too hilly with 884m climb and nothing memorably bad; I can’t even remember where the spikes below were! The next section was by far the least scenic, running parallel with the M1 through various industrial estates. I quite enjoyed it though – reminded me of cutting my running teeth in Leeds. Also my feet were overheating so I found some good puddles to run through & hey presto, no blisters! Had budgetted 75 mins for this (6.3 miles) and came in just under, getting to the Treeton Checkpoint at 10am. It’s at this point you need to start making sure you’re eating enough, taking Ibuprofen etc. so I had a wrap and a boiled egg. But too depressing yet to think of the miles left to do! Possibly the trickiest bit of navigation was a dogleg up the A57 to re-descend to the railway line you were following originally but on the other side. 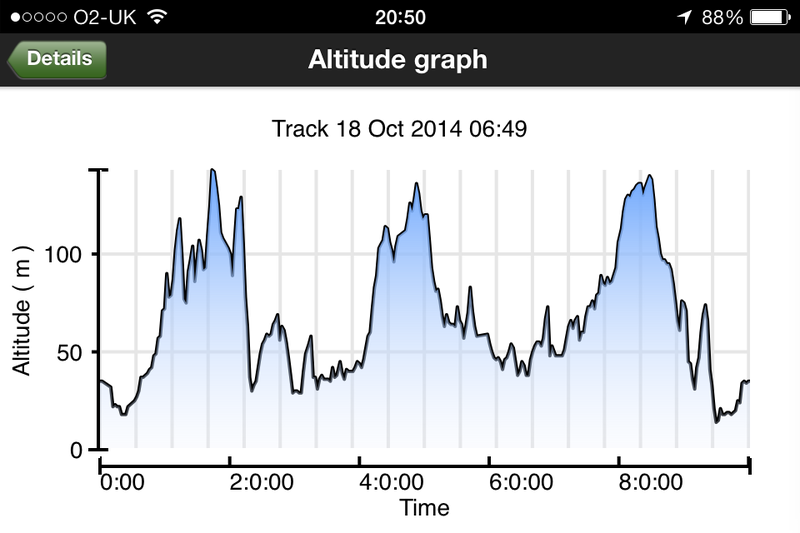 Fortunately one of the posse I was with had the route on his phone, which saved me getting out my Wainwright srips. Next was the Rother Valley Country Park, with its lakes and families doing their Saturday morning stuff – opened in 1983 on former quarry land. Then the dreaded ploughed fields (what felt like 20 miles of them!). They could have been worse, but each of my SpeedCrosses weighed in at 450g afterwards! Harthill was very pretty and we got another fantastic welcome at the checkpoint. With Harthill being at 25 miles (4.5hrs) it was now OK to consider what was left. I was still feeling good, the sun was shining & my pasty was calling me from Checkpoint 4. I got there at 12:40, was handed my drop bag and wolfed it down, chased with coffee & RedBull. I didn’t dare sit down in case I cramped, which I tend to do these days the minute I point my toes. The bags were going to the Finish so it was good to dump any old map sheets, as well as my torch, which I knew I wouldn’t now need (only 20 miles to go at 12:45!). More nice rural sections but alarmingly my fingers started going numb 40 mins after the pie so I had a 9Bar and a gel and feeling came back. Then, at the lovely Roche Abbey I started feeling sick and had to walk even though it was flat. I had a couple of Hula Hoops but wasn’t able to chew or swallow them very well, so I decided my digestive impulses had packed in and not to worry about it. Just had a bare minimum of food from then on and, sure enough, got a 2nd wind. Really these just went by in a blurr, hoping to get in under 10 hours! The last 2 miles of navigation got very tricky as we crossed a railway, an industrial estate & the River Don, and I was grateful to the runner from Leeds who repeatedly gave me directions. We both made it to the Finish in 9hrs 50 mins to a great cheer & welcome sit-down.This has to be the best-value race I’ve ever entered, my £19 got m floor-space in the sports hall to sleep the night before, hot meal (x2) plus snacks and drinks en route, T-shirt & cloth badge. I got back home at 7pm (no navigational mis-haps this time!) having thoroughly enjoyed my Rotherham adventure. A big thank you to all the helpers (it’s a slick machine you’ve got going there!) and great company on the way round.